The Chinese crested originated in Africa where they were called “African Hairless Terriers.” Chinese trading ships stopped along the shores of Africa on their routes, and brought the dogs onboard their ships to hunt vermin. They renamed them the “Chinese Crested” and the name stuck. Ancient wandering Native American tribes (Aztecs) kept them as bedwarmers, and is has been thought they were used as a food source. Two Chinese Crested were first exhibited in 1885 at Westminster Kennel Club Show in New York. However in 1965, due to the lack of a national club to support the breed and the small numbers, the AKC dropped their eligibility to be shown. The first American breed club was established in 1979 and they were recognized by the AKC in 1991. The most popular of the hairless breeds, the Chinese Crested are still very rare. These dogs are alert, charming, agile and lovable. They are affectionate and playful with children. Children should be taught not to play rough with this breed as it is friendly, but does not have the protective hair that other breeds have and can get injured easily. Never baby this breed as it may cause them to be timid. Socialize them well, starting when they are a small puppy, exposing them to loud noises and outside activity. The Chinese Crested likes to climb and dig holes. The tend to become very attached to their owners. These dogs enjoy companionship. They are prone to gaining weight fast if they are overfed. Exposed skin on the hairless dogs need special care to prevent skin irritation. The hairless dogs do get sunburn and a good sunscreen should be used if the dog will be out in the sun. The hairless variety is prone to tooth loss and decay. Powder puffs have healthier teeth. Both the hairless and powder puff dog can be born in the same litter. Although it is tempting to carry these dainty creatures about; these are active little dogs who need a daily walk. Regular play will take care of a much of their exercise needs. However, as with all breeds, play will not fulfill their primal instinct to walk. Dogs who do not get to go out on a daily walks are more likely to to display an array of behavior problems. 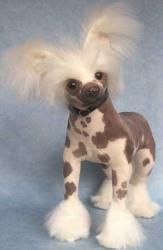 Chinese crested are very clean, with no doggie odor. Powder puffs need a lot more grooming. Daily brushing of the powder puff’s long, fine, double coat is recommended, taking extra care when the dog is shedding. The woolly undercoat becomes matted if neglected. Bathe the hairless frequently and massage a little oil or cream into the skin to keep it supple. These dogs shed little to no hair and are great for allergy sufferers. The hairless variety are not prone to fleas.